The Anne and Edgar Basse Jr. 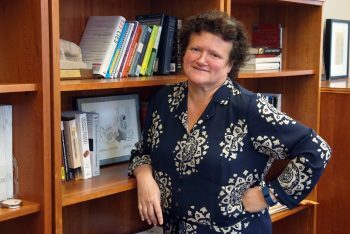 Author Talk Series, presented by the Leyburn Library at Washington and Lee University, presents Alecia Swasy, the Reynolds Professor of Business Journalism at W&L on March 21 at 4:30 p.m. in the Book Nook on the main floor of the library. She will be discussing her new book, “How Journalists Use Twitter: The Changing Landscape of U.S. Newsrooms” (2016). The talk is free and open to the public and refreshments will be provided. The book examines how leading reporters and editors at four major metropolitan newspapers are embracing Twitter as a key tool in their daily routines and how the social media platform influences coverage. It builds on social media research by analyzing newsroom work through the lens of four different communications theories—diffusion of innovation, boundary, social capital and agenda-setting theories. Swasy also taught business journalism at the University of Illinois and continues to work with the Donald W. Reynolds Journalism Institute at the University of Missouri School of Journalism. Her professional experience include assistant managing editor/equities at Dow Jones & Co.; The Virginian-Pilot, where she was deputy managing editor for sections; The St. Petersburg Times (now The Tampa Bay Times), where she was assistant managing editor and business editor; and staff writer for The Wall St. Journal. Swasy’s work includes “A Little Birdie Told Me: Factors that Influence the Diffusion of Twitter in Newsrooms” (2016), in Journal of Broadcasting & Electronic Media; “Who do you trust? Comparing the Credibility of Citizen and Traditional Journalists,” (eds., 2015), in Newspaper Research Jourrnal; and “Co-Viewing, Tweeting and Facebooking the 2012 Presidential Debates,” (eds., 2015), in Electronic News.